Furniture can be one of the most burdening costs for any home or office, especially if you want to buy high quality furniture. However, some people now try to reduce this cost by buying and importing furniture from China at wholesale price. You can find all kinds of furniture in China, starting from economic and industrial and all the way to chic and elegant. The most obvious place to buy furniture in China is Shunde or Furniture city. Shunde is about 40 km south of Guangzhou, it is an entire city devoted to manufacturing, wholesale and retail of furniture. Shunde is also known as “Furniture City.” It is well connected with Hong Kong and Guangzhou by a network of trains, ferries, subway and buses. It can be reached by taxi from Guangzhou in one hour. The town is home to over 1500 furniture manufacturers and 3,500 Chinese and international furniture dealers displaying their products in 200 modern buildings covering an area over 3.0 million square meters. While Shunde is home to thousands of furniture retailers it does not have many hotel and restaurant options. However, there are a few Western-style hotels and restaurants in Foshan, which is only a half hour drive from Shunde. 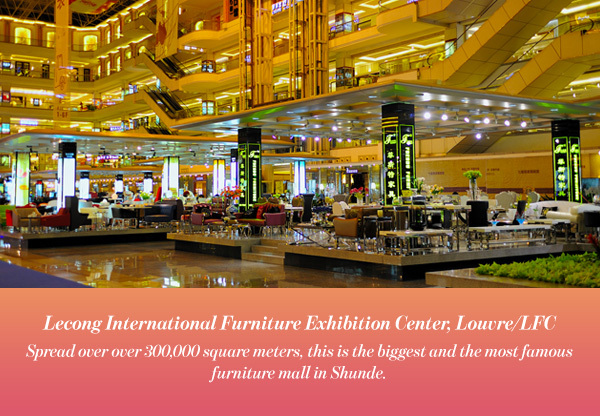 Spread over 300,000 square meters, this is the biggest and the most famous furniture mall in Shunde. The massive seven-story building houses hundreds of furniture wholesalers and retailers. And the top floor of the building has a restaurant that serves Chinese and Western dishes. The maps of shops are easy to follow and they are arranged by style of furniture, including modern, classic and traditional Chinese. The fourth, fifth, and sixth floors have office furniture while the other floors are devoted to home furniture. 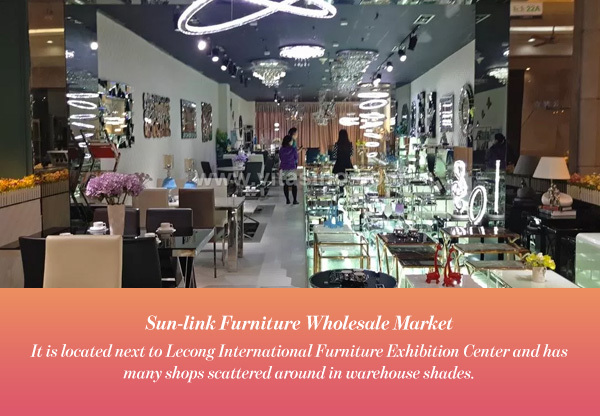 It is located next to Lecong International Furniture Exhibition Center and has many shops scattered around in warehouse shades. It is important to note though that while the prices are cheaper than LCF the quality is not as high. However, it might be a good choice for those looking to buy furniture on a low budget. 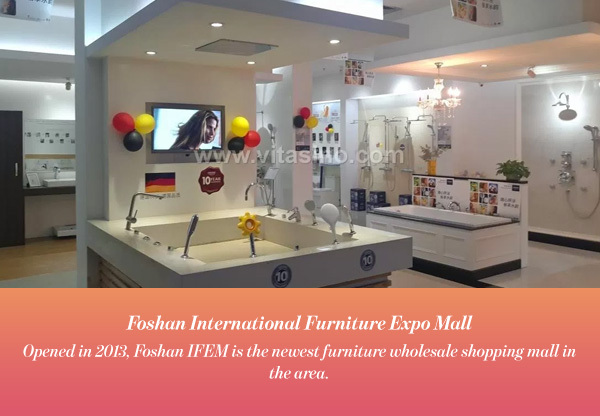 Opened in 2013, Foshan IFEM is the newest furniture wholesale shopping mall in the area. The mall is built over an area of 800000 square meters and houses more than 3000 shops. 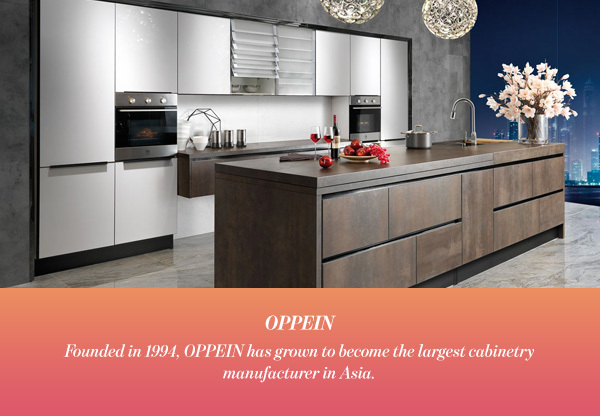 Founded in 1994, OPPEIN has grown to become the largest cabinetry manufacturer in Asia. They provide kitchen cabinets, wardrobes, bathroom vanities, built in furniture, interior/exterior doors, full house design/project and kitchen accessories. Today, OPPEIN boasts a 500,000 square meter manufacturing center. Foshan Shunde Maryard Co., Ltd. is located in Shunde District,Foshan City. They specialize in producing outdoor furniture and appliances, including aluminum wicker furniture, stainless steel furniture, teak and aluminum furniture, outdoor umbrellas and extension tables. The company has been manufacturing with advanced production equipment for decades. Their products are mainly exported to Europe, America, Japan and the Middle East. 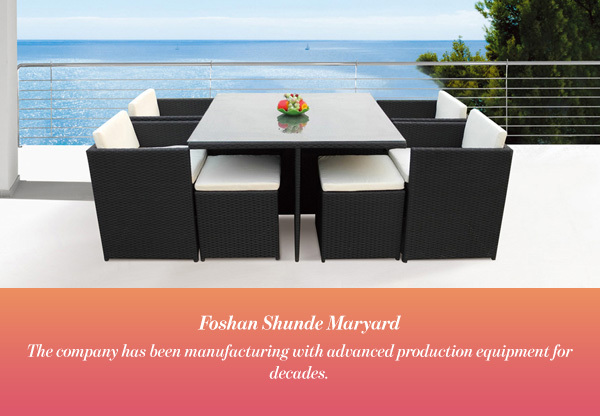 Maryard takes pride in manufacturing the outdoor furniture for the leisure life. 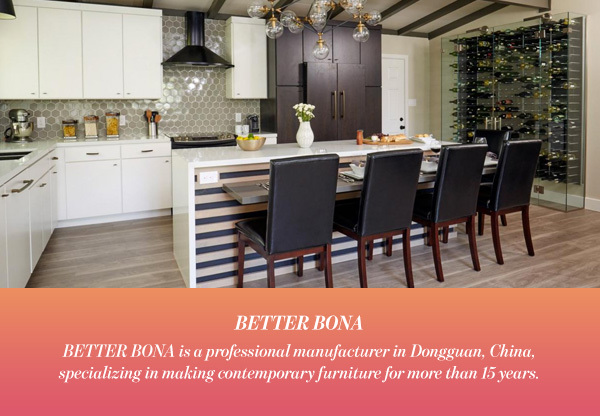 BETTER BONA is a professional manufacturer in Dongguan, China, specializing in making contemporary furniture for more than 15 years. They provide stylish, contemporary and high quality furniture at affordable prices. They can provide you with all the furniture you would need for your Living Room, Dining Room, Bedroom and Office. Their factories have three stages Quality Control system, so quality can be guaranteed. They also use Echo-Friendly material and their products are made under American standard. 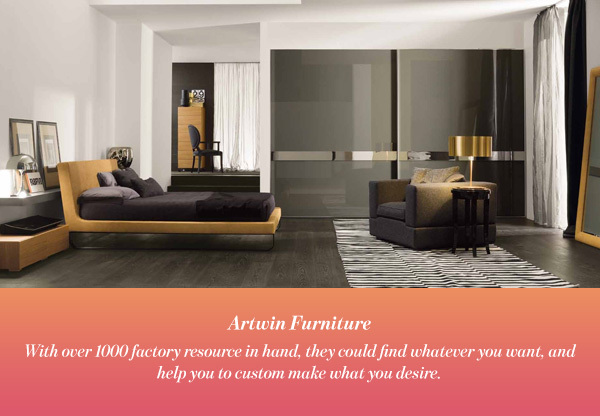 Artwin Furniture has been working in furniture and accessories sourcing over 10 years. With over 1000 factory resource in hand, they could find whatever you want, and help you to custom make what you desire. 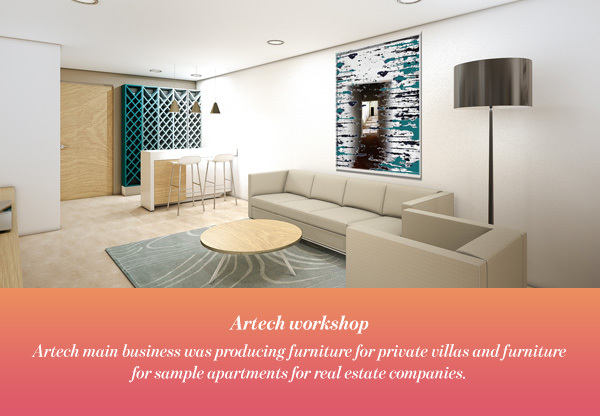 Founded in 2001, Artech workshop initially functioned in customized furniture for high end customers. Artech main business was producing furniture for private villas and furniture for sample apartments for real estate companies. Over time Artech grew and started producing hotel furniture and club furniture. And in 2007,the factory began to produce mattress and modern sofa. Ask for an English speaking staff member. In general, most shops provide invoices and sales contracts in English and Mandarine so make sure to get an invoice you can understand clearly. 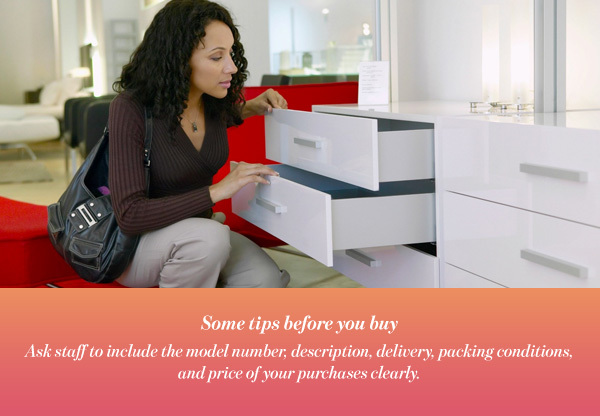 Ask staff to include the model number, description, delivery, packing conditions, and price of your purchases clearly. It is also advisable to hire the services of an agent who can provide export shipment & logistics services. If you are buying most of the items from one shop they can book, load, and ship furniture for you for a small fee. Otherwise you will need to hire an agent to handle import from China. Typically these agents will charge 5% of total purchase value to handle all aspects of shipments. Does it make sense to buy furniture from China? This depends on several aspects. First one is: How many items are you looking to buy? If you are buying for an entire house or more than one house, with a budget of USD $50,000 or more, it makes sense to buy all of the furniture in China. The price of furniture in any other country could be easily three or four times the price of furniture in China. Another point to consider is the trip itself; it will cost time and money. Do you consider this a chance to visit an exotic country? Do you have the time? Consider your options first and check if it makes sense for you to buy furniture from China.